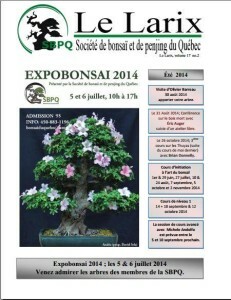 The day of introduction in the art of the bonsai is a nice opportunity of familiarized with this art milennium. This training is perfect for people who want to learn more about the world of bonsai and who want to try the basic techniques. This lesson of a day is given by an experienced professor at the nursery Bonsaï Gros-Bec. The course consists of theory where will be introduced to you the foundations of the art of the bonsai and where you will received all the necessary material. Then, supervised by the professor, you will be invited to create your own bonsai by using basix techniques. From the end of the day, you will leave with you new finished bonsi in a splendid ceramic pot. All the equipment is furnish : Pre-bonsai, technical data sheet, substrate, ceramic bonsai pot, aluminium wire, etc. Besides, you will become automatically member of the SBPQ for free for a period of one year (30$ valur, see advantages of membership for more detail). If a date is suitable for you, use the inscription sheet. – If you must be accompanied by someone not interested in bonsai, he can still be present in the course and on the site of the nursery without participating. In that case, we ask for a 10$ fees for observer. – You wish to organize a day for a group, nothing easier! If you are 6 and more, we can accomodate you with the date of you choice, just contact us.